What Safeguards Does the BMW i8 Employ When an Impact is Imminent? BMW engineers seek to increase the safety of the occupants of its vehicles through advances made in technology. Statistics demonstrated to the engineers that collision dangers increase after the impact. Engineers inserted an impact sensor and a program that swings into action when that sensor is activated to mitigate post-impact concerns. 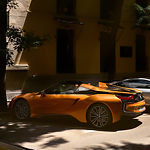 Upon sensing an impact, the BMW i8 utilizes a program that immediately disconnects the battery, the fuel pump, and the starter generator, minimizing the possibility of fire and noxious fumes. Whether the impact occurs in Medford or out on the road, the system automatically opens doors and turns on hazard and interior lighting. With this safety program in place, the death toll from impact accidents gradually decreased since 2015 when the package was first used. Our trained and certified technicians at Medford BMW maintain this crucial safety device at each service appointment.